Soooooooo, we decided to visit Croatia on a little bit of a whim. 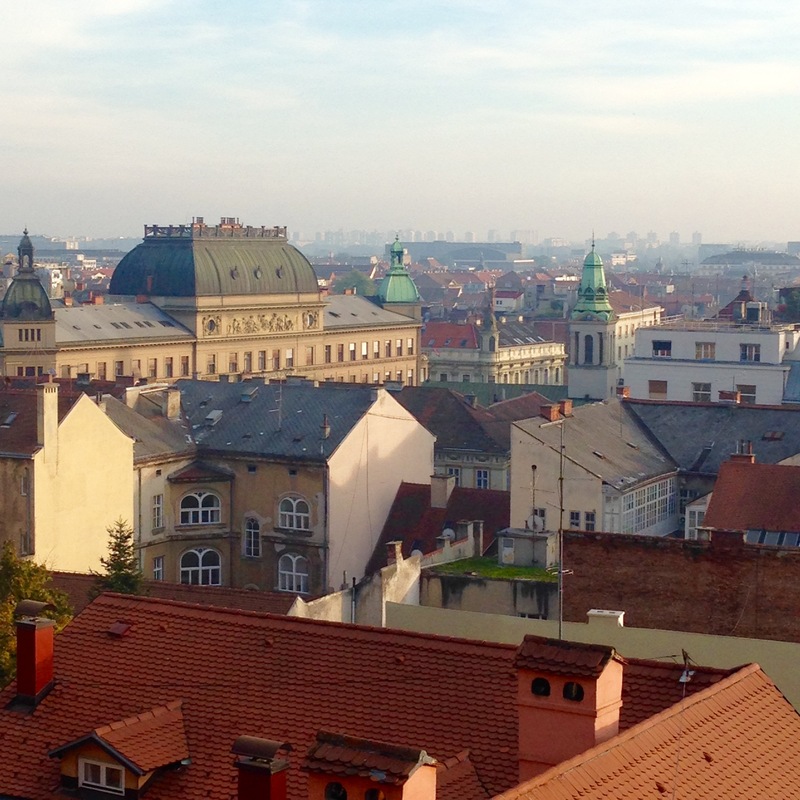 We took a red-eye flight out of Montreal, had a layover in Munich, and landed in beautiful Zagreb. We felt like seeing Croatia’s capital, rather than the coast, which seems to be more of a popular tourist destination. On our way to our apartment, our first impressions of the city were the tall concrete apartment buildings and their communist-era architecture, which stood very far away from one another. 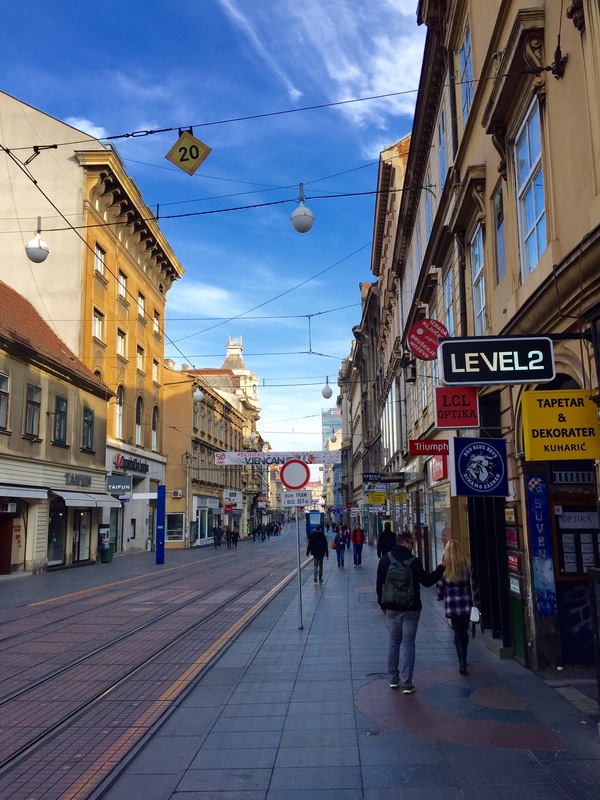 We finally made our way onto the main street “Ilica” (pronounced Ilitsa), which, at 6 km long, is one of the longest (and oldest) streets in Zagreb. It is an interesting street as many old houses are still there and remain as they were back in the day, albeit quite run down, which contrast a fair deal with the newer fashion boutiques, craftsmen, caterers, jewellers, perfume shops, etc. (ideal for shopping lovers). 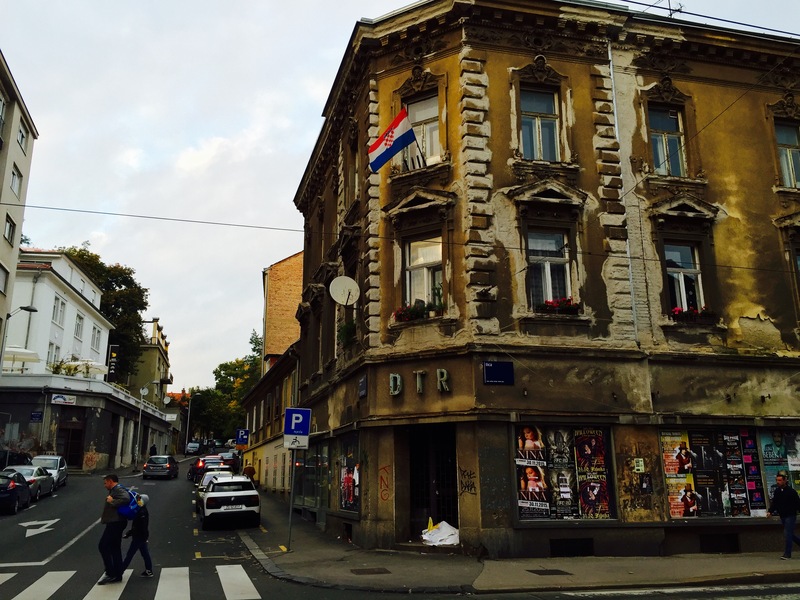 Part of Ilica street’s beauty lies in its neighbouring alleys. The deceptively hidden passages lead to hidden back alleys where charming restaurants, designer shops, old-school barbershops, and other such places were hidden. We were lucky enough to have our amazing friend Vjeran host us at his appartment for this leg of the trip. I was feeling congested from the leftovers of a cold, made worse via airports and flying on air conditioned planes, so at 11h00 a.m., Vjeran welcomed us/woke us up (and annihilated any viruses or bacteria incubating within me) with a shot of Croatian liquor – rakija (pronounced rakia)! Rakija is a strong liquor fermented with local herbs such as mint, lavender, rosemary and sage. It put a huge grin on our faces – due to how difficult it was to drink. As the old wives’ tale has it, rakija has healing powers – it is thought to relieve stomach and muscle pain, disinfect a wound instantly and destroy bacteria. Vjeran is a firm believer of rakija. He claims that when he was young and had injured his ankle, his grandma had wrapped a cloth drenched in rakija around his ankle, only to find that the next day, the swelling had gone down considerably. Fascinatingly, this was the apartment where our friend Vjeran spent the first 4 years of his life. It is also the apartment where his grandmother spent her entire life. Every decoration and ornament in the house reminded me of my own grandma’s place – pretty old fashioned. 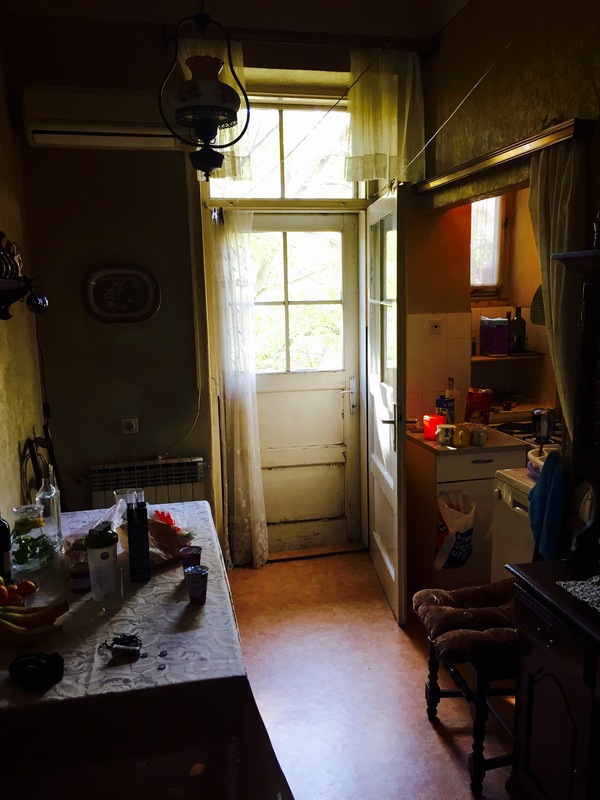 It was great to live in a local’s apartment and feel like a true Zagrebian. 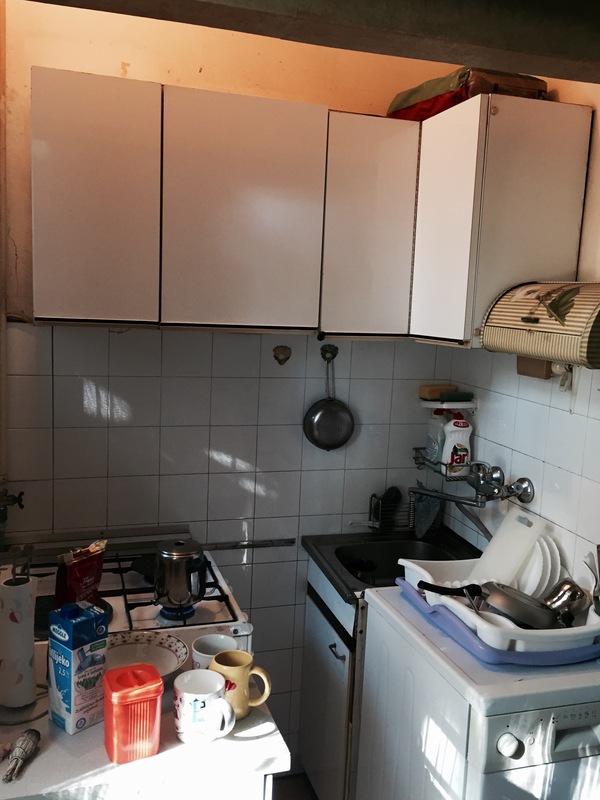 My favourite room in the apartment was the kitchen. It was pretty small, and the space we had to cook was even smaller. It reminded us of the importance of family and how you don’t need much in life to be happy. This kitchen is where we had most of our breakfasts: home-made cornbread with rose hip jam and fresh fruit. Our first foodie pit stop was Dubravica, a super fresh bread, sandwich and pastry shop. We grabbed a slice of button mushroom, sweet corn & paprika pizza and a blueberry & vanilla danish. These were exquisite. 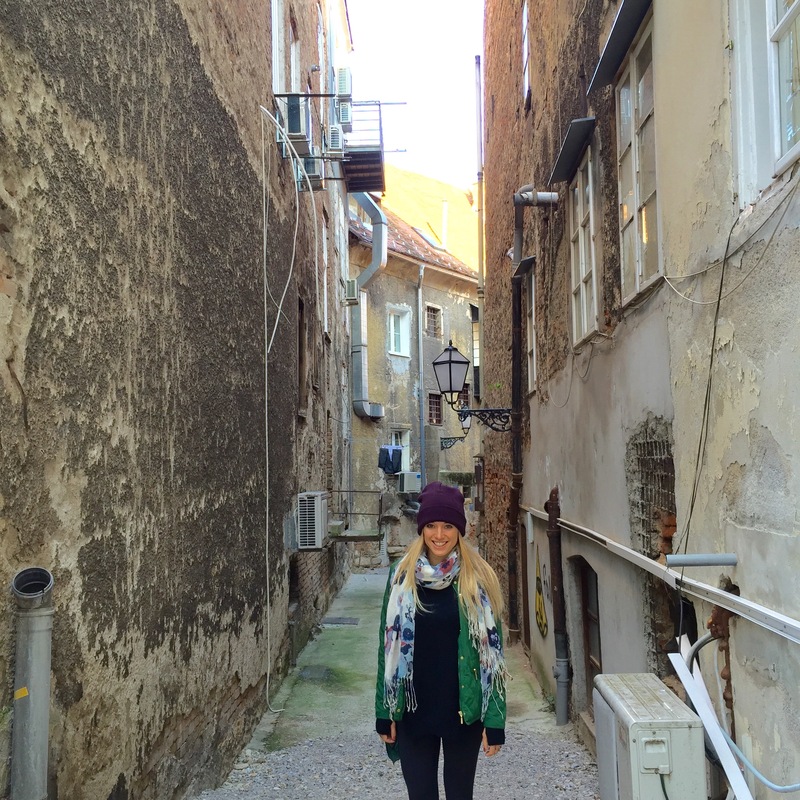 This is where we learned our first Croatian word – Hvala (pronounced “fala”, and which means “thank you”!). This is where we also learned that if you depended on what your peepers saw, you would think “pastries” is the main food group here. There are phyllo pastries and sweets everywhere you look. 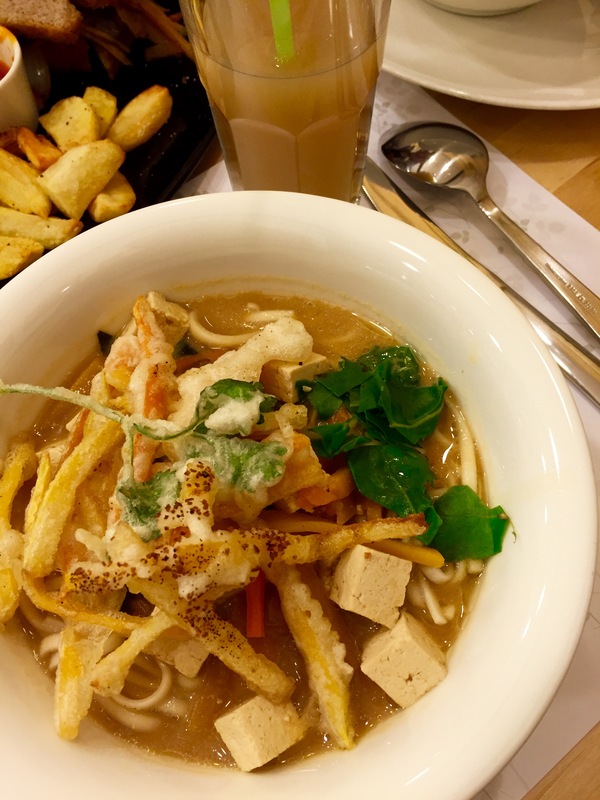 So what did we eat in beautiful Zagreb? When we told people we were vegetarians, the typical reaction was hysterical laughter and being told we would not find much to eat in Zagreb. I can recall a particular instance when we asked a young man what vegetarian options his restaurant offered. After giving it much thought, he laughed and replied “We have french fries…and chicken!?”. We burst out laughing. At first, we stuck to hitting up the farmers’ markets. On the positive side, Croatians seem to be pretty big on organic produce and request to know if their food is “sprayed” or “non-sprayed” (with pesticides). It was great to talk to the farmers and witness their pride for their produce and hear them share information about this year’s harvest. However, we did discover Zrno, a restaurant named after the farm which supplies it with all its organic (organski) produce. Zrno means grain, and the Zrno farm was actually the first organic farm in Croatia. The restaurant also conveniently happens to be vegan. On our first visit, we were greeted by the friendly owner, Jadranka Boban Pejić, in her mud-covered Hunter boots (we later found out she was coming directly from her farm). Amazingly, she started the project that was Zrno with her husband back when the war was only beginning and has been going strong ever since. She is a fearless and inspiring woman. On another note, her restaurant has the most amazing sweet potato fries. Funky posters inside ZRNO adorn the walls and express their food philosophy. All food served at the ZRNO restaurant comes from their farm, which is why the meals on the menu are made with limited ingredients, forcing them to be inventive and which inspires them to think creatively. 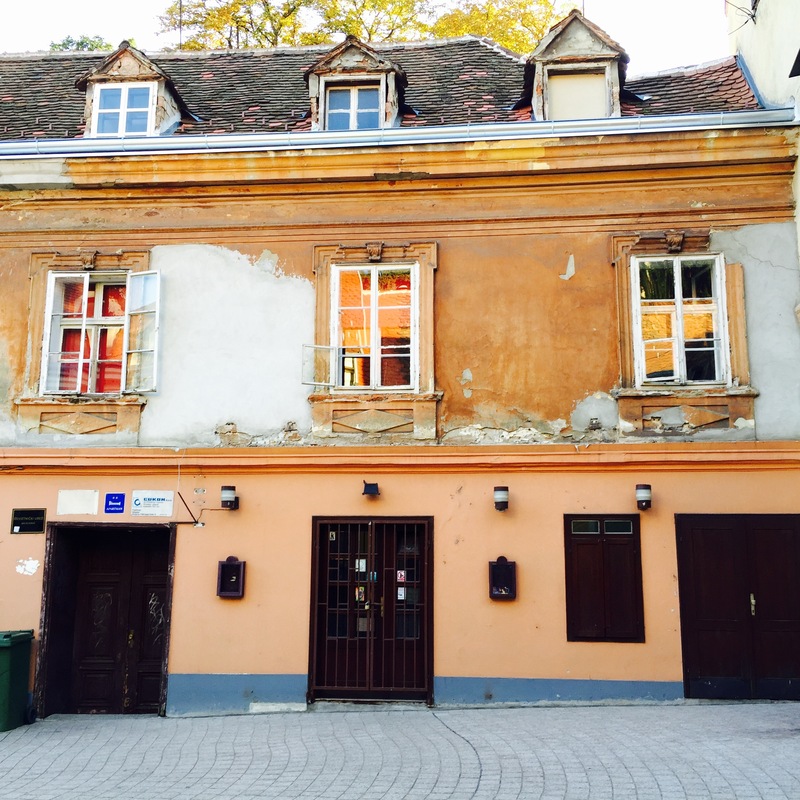 Needless to say, ZRNO became a go-to spot for us – and we went back. Often. We were lucky enough to sample almost everything on the menu. My favourite was a vegan cordon bleu that tasted exactly like the real deal. I wouldn’t know how to recreate it if I tried (did I just challenge myself? Think so! 😉 ). Breaded tofu for the win! We also enjoyed a fair deal of Croatian wine while in Zagreb. Croatians will often enjoy a glass of wine with a meal, though they often dilute white wine with sparkling water (yielding gemišt) and red wine with still water (yielding bevanda). We stuck to our “boring” ways and chose not to mix our wine with water though, haha! Apart from food/Zrno, Zagreb had much to offer in terms of tourism. 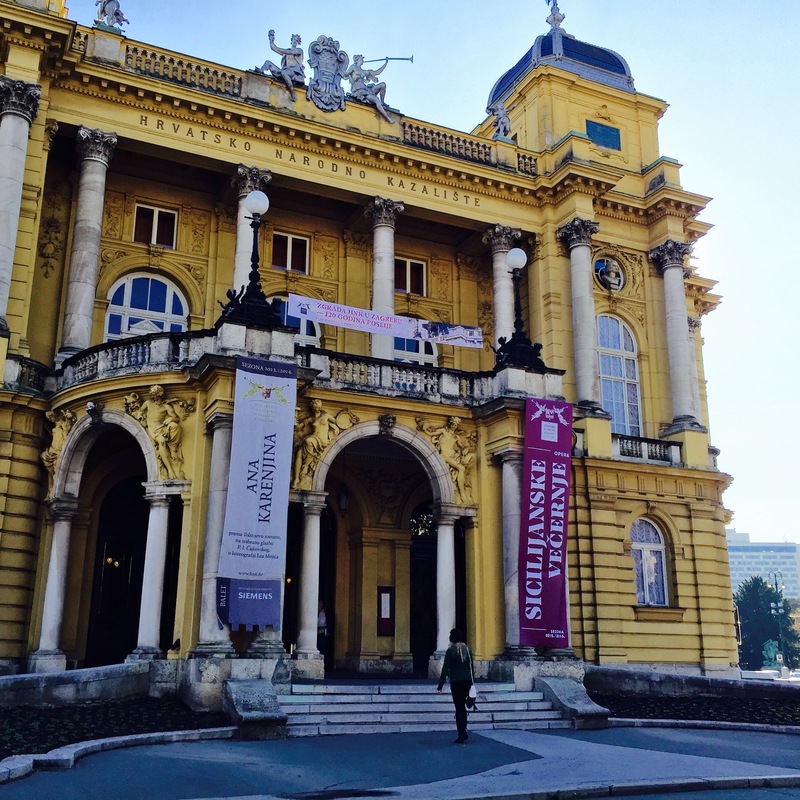 Below is the picturesque opera house and national theater with breathtaking architecture. It is so beautiful both inside and out (like all of us – lol). 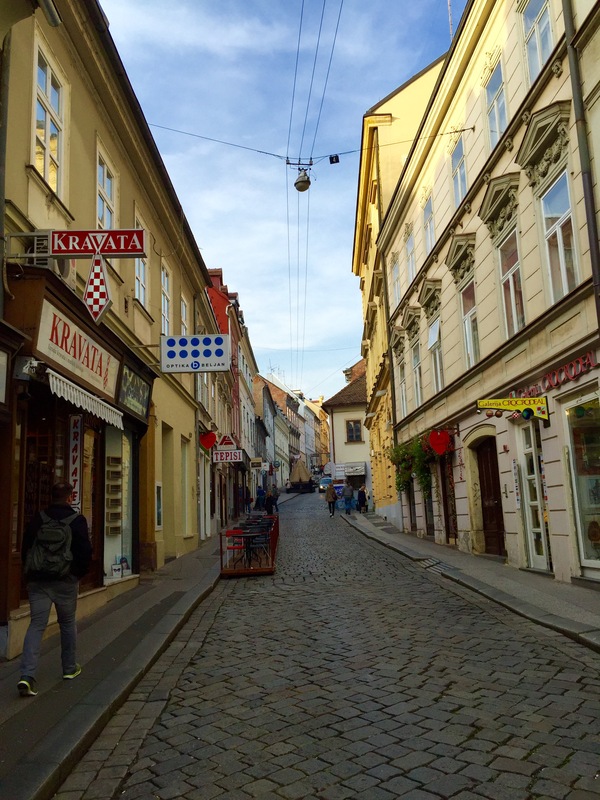 Zagreb is not too huge of a city so one can easily get around by foot. By doing so, it becomes evident that terrasse culture is big here. As of 4 pm, be it a weekday or the weekend, terrasses are full houses. Many people in Zagreb are smokers, which makes terrasse life a little less appealing to us who prefer our lungs pink. Zagreb isn’t that multiethnic. Also, you can occasionally spot nuns roaming the streets. All of these things add to the overall ambiance in this city. 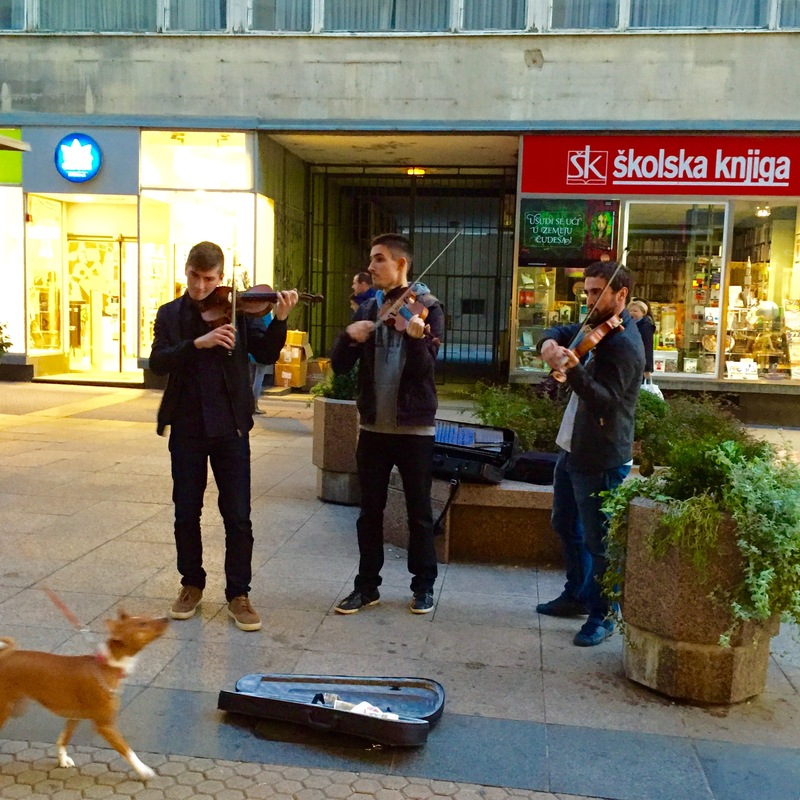 Below are some violinists we stumbled into on our way to a pub. We only stayed long enough to catch 4 songs, including Coldplay’s “Viva la vida” and Bruno Mars’ “Just the way you are”. These three were so talented, it made me cry (what else is new? haha). So soulful! I tried to look up these incredible musicians but I couldn’t, but found this and this, which can provide an idea of what their music sounded like. Now, I’m obsessed with violin covers of pop songs. Below is a “Kravata” store. In french, the word “cravate” (meaning tie), comes from “kravata” which comes from “croat”. In the 1600’s, white scarves worn like ties used to be worn by Croatian Hussars, and the word cravate is a deformation of the word “croate”. 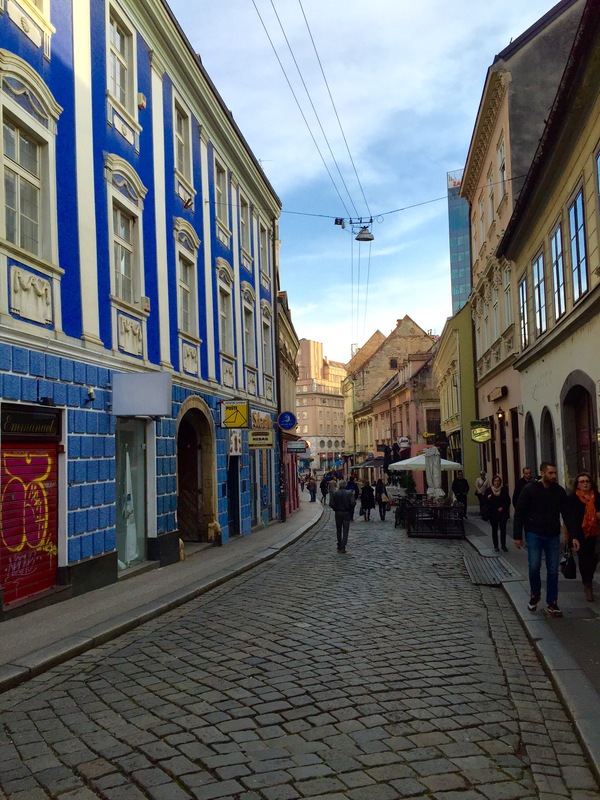 Colourful streets leading up to St-Mark’s Church, which has a gorgeous tile mosaic roof. 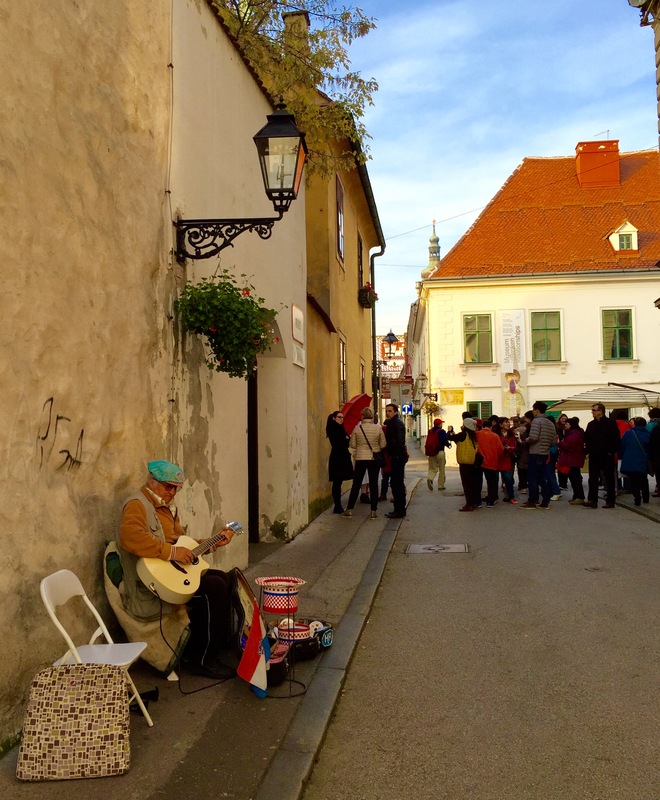 Street musician giving the town a musical breath of life and brightening up our day. Taking in the view from a lookout point.